With this summer’s release of Art of McSweeney’s, Dave Eggers and co. may have provided the most compelling reason yet to hold off on buying a Kindle. 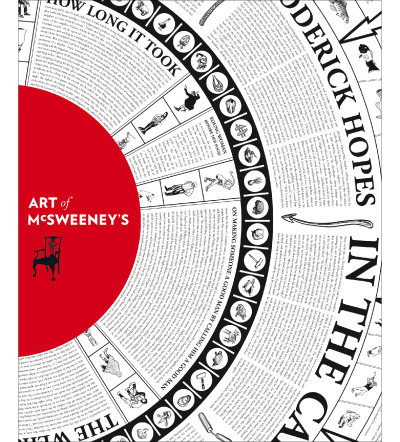 Though Art of McSweeney’s is technically an anniversary tribute to the unfailingly original visuals in the pages and on the covers of all publications under the McSweeney’s umbrella — The Believer magazine, McSweeney’s Quarterly Concern, all four imprints of McSweeney’s Books — the über-illustrated tome is a typically large McSweeney’s undertaking, a tribute to the very existence and possibilities of print media. “We spend a good deal of time editing books, and producing books of the highest quality we’re capable of, in the hopes that in doing so, we’ll keep people mindful of the pleasures of the book-as-object,” explains Eggers in the book’s early pages, alongside his dedication to “these physical books that purportedly have no future”. True to their mission, the McSweeney’s team has created an object that can only be properly experienced in hard copy. From diagrams to illustrations to behind-the-scenes photos (Joyce Carroll Oates playing Sega stands out as a highlight) Art of McSweeney’s reads like a 264-page love letter to all things printed and bound, complete with a muse board of old school book covers that would make Kanye West proud. Photography by Mario Tama, courtesy of Umbrage Editions. In the immediate aftermath of Hurricane Katrina, New Orleans became a magnet for photographers, journalists, and 24-hour media attention. But not too many of them stuck around for the slow, problem-addled rebuilding process, and of those who did, few have captured the city and its embattled residents as poignantly as Getty Images photographer Mario Tama. In his tireless efforts to document the unprecedented levels of destruction, Tama has amassed a collection of images unique in the way in which they showcase the small moments of hope and resilience that accompany tragedy and frustration. 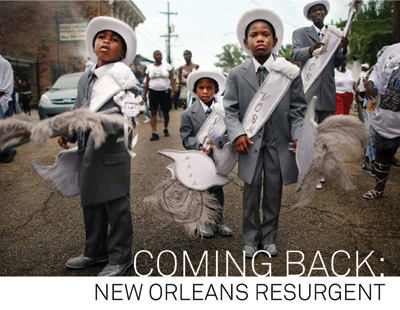 On the heels of the hurricane’s fifth anniversary, Tama has collected his award-winning snapshots in Coming Back: New Orleans Resurgent, featuring photos that highlight both the ongoing need for recovery and the unbelievable tenacity of the city’s residents. The book, which also has an introduction courtesy of Anderson Cooper, was released this past weekend and is a sharp reminder of the power of photojournalism done well. In the meantime, Tama’s work is also being showcased in twin exhibits in New Orleans and in New York at Brooklyn’s Umbrage Gallery — be sure to catch it before it closes this Wednesday. A portion of proceeds will go toward New Schools for New Orleans, a non-profit that has been instrumental in updating the city’s public education system. With the recently opened Treehotel and now Villa Nyberg, Sweden seems to be making a case for itself as the world’s hub of cutting-edge green architecture. In collaboration with Emrahus and commissioned by the Nyberg family, all-star architecture firm Kjellgren Kaminsky has just unveiled Villa Nyberg, setting a new standard for the concept of the “passive” house. Still a budding art form in the world of green architecture, passive houses are designed to draw on the energy — and there’s always quite a bit of it — created by the house’s residents and their appliances, thus wasting as little energy as possible for basics like heating. The houses are extremely well insulated, and tests have recently found that the Villa Nyberg will only consume kWh/m2 per year for heating and has set a new airtightness record for Sweden. 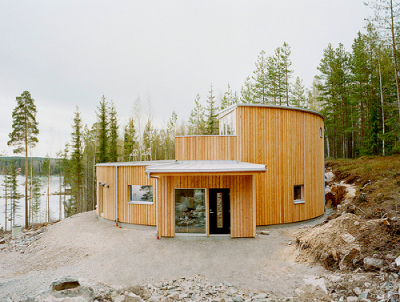 Views from the Villa of the adjacent lake in Borlänge, Sweden are an instant reminder that Kjellgren Kaminsky has given as much attention to form as to function with this house, which has been given its circular shape for purposes of airflow efficiency. As one of the world’s leading firms for passive houses, Kjellgren Kaminsky is now aiming to make eco-friendly architecture, normally the territory of elite home buyers, a more accessible option, meaning we may live to see the day when the word “passive” can be applied to the world of New York real estate. It’s no secret that the hotel world and the design world have started to overlap more and more in the past several years, with ultra-stylized hotels cropping up in just about every major destination. 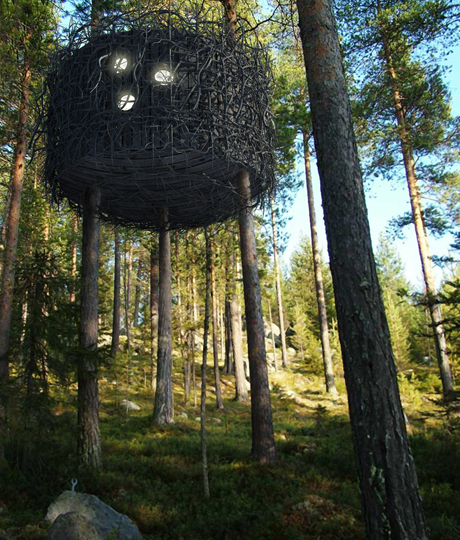 Kent and Britta Lindvall have, shall we say, elevated the concept with their new Treehotel, located 15.2 meters above the ground in the forest of Harads, Sweden. Perched in the trees and accessible by retractable ladders, the hotel has become both a coveted travel destination and something of an architectural marvel. 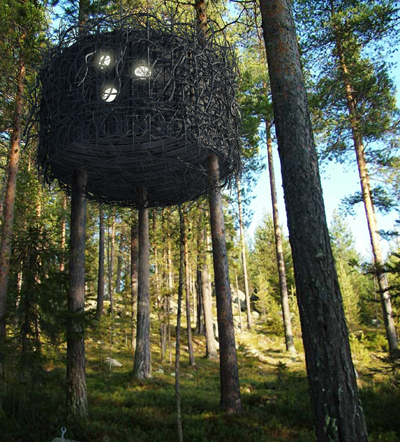 Treehotel currently has four rooms available (with plans for more in the coming months), including the Bird’s Nest, which looks and functions essentially exactly like it sounds. Perhaps the most eye-catching so far is the Mirrorcube, the brainchild of Tham & Videgård Architects (each room is designed by a different prestigious architecture firm). Constructed of aluminum and wood, the Mirrorcube’s reflective walls are designed to fit in with its surroundings and to essentially be invisible, with infrared film embedded to make it visible to birds, naturally.